Well here it is..... my first tutorial! I was very anxious writing this and hope that my instructions make sense.... if not please let me know. I would love to see pictures if any of you do make one. These measurements fit a camera 2.5" wide x 4" long and 1" thick with a little room to move. For my ipod classic I cut all pieces 3.75" wide instead of 4.25". Iron wrist strap in half lengthwise to make a centre crease then unfold and iron in both long edges to the crease. Iron in half again to conceal the raw edges and make a narrow strap. Stitch close to edge. Iron SD card pocket in half, right sides together so that the short ends meet and stitch down both sides using a 0.25" seam. Turn right side out, press and topstitch folded edge. Position the pocket upside down with the raw edge 3" from the bottom of the right side of the 7.5" lining piece and stitch in place with a small seam. Iron pocket upward and stitch around three sides to secure in place. Backstitching at beginning and end. 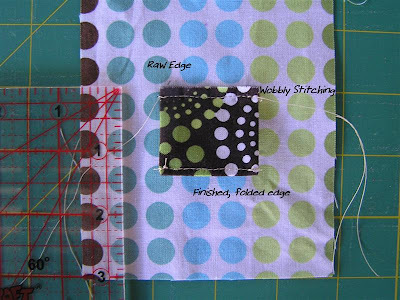 Place the two 5" fabric pieces right sides together and stitch using a 0.25" seam along the short edge. Iron out flat. On the the 5" piece of main fabric position velcro so that the bottom edge sits 1.5" down from the seam line and stitch in place. For the magnetic clasp position so that the top edge of the clasp sits 0.75" down from the seam line. Matching wrong sides, press and topstitch folded edge through all layers. Taking care when ironing not to melt the velco like I did on my first attempt! On the wrong side of the 7" lining piece, position the square of interfacing in the centre about 0.25" from the top edge and iron in place. Using a rounded object (I used a small ramekin), mark the shape you'd like the flap to be and cut along the marked line. If using a button closure: Sew across the hair band like this to form a loop to go around your button and trim close to stitching. (Make yours smaller than the one shown as I had to unpick and shorten this one). Position the hairband at the top end of the main fabric and pin or baste in place. Lay the 7" main fabric piece face up and pin the strap in place about 4" from the bottom edge on an angle as shown. position the smaller 5" piece main fabric face down with the lining fabric face up and then place the 7" lining piece on top, right side down and pin in place. Make sure you tuck the strap out of the way so you don't catch it in your seam. Stitch around leaving the bottom edge open for turning. Trim rounded end. Pin and stitch across bottom edge, trim with pinking shears/zig zag/overlock to finish edge. Turn right side out, press again and topstitch around flap. I've also made them with pieced fabric which looks great and I added a lobster clasp to one on a shortened strap which is very handy also. You could make smaller ones for mobile phone pouches and if you're making them without the Strap or pocket they're super quick to whip up! These are fantastic. I've tagged this to have a go soon. Thanks Tracy. Thanks, I will have a go at this,it looks great! just finished! I had issues of course, I always have issues (i'm a bit of a lazy sewer), but it still turned out good. thanks so much for posting this tutorial!